Th-INK-ing of You: Our Daily Bread designs January DT Challenge! Hello everyone! Welcome to the first Design Team Challenge of 2010 at Our Daily Bread designs! Chris Olsen challenged us this month to use brown, and to use punches or dies. Easy peasy right? We invite you all to play along with us. You have until Jan 23 to link your card to Mr Linky on the ODBD Blog Challenge for a chance to win one of TWO prizes that will be randomly drawn. The prizes will be $15.00 gift certificates to go toward stamps at the Our Daily Bread designs Store! 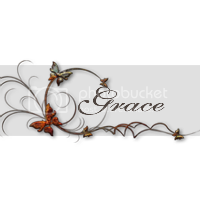 If you use an on line gallery, please use key word ODBDC110. As I mentioned on Jan 1st... we are celebrating this month because we have been selected to be a Member Company on Splitcoast Stampers! We are very excited and have lots of fun things planned for our forum there! These is a Prayer Request thread, chit chat and a challenge thread. Stay tuned for weekly challenges that will mean more prizes and more fun for everyone!!! To celebrate our new member status, we are giving away a BIG prize to one lucky winner... a $50.00 Gift Certificate to the Our Daily Bread designs store! To enter that drawing, simply leave a comment on the Welcome ODBD Thread by Jan 10! You still have time to be entered so hurry on over and leave us some love!!! I used the Our Daily Bread desingns Jan. release set Confirmation. This set is quite versatile and there are two other sets this month, so be sure to check out all the new releases! I stamped my cross image lightly on Papertry Vintage Cream with River Rock SU! Ink. I stamped it again in Chocolate Chip and just cut out the bird. I sprayed it with Glimmer Mist Pearl. Very sparkly! The sentiment is part of the God Bless You on your Confirmation sentiment... I masked off to just use the God Bless You and stamped on Vellum, cut with a Spellbinders Double Ended Tag and adhered over the base of the cross with two antique bronze brads. My card base is Papertrey Dark Chocolate, the matting is River Rock which I embossed with a CB edge EF. I did a matching panel on the inside and stamped the dove on the envelope. I used a Martha Stewart edge punch for the pines around my image, and I used Papertrey Perect Match ribbon. The prickly pine boughs made me think of the crown of thorns they placed upon Jesus' head. Thanks so much for looking today! Please play along with us on this challenge! It's so easy and you just might win!!! Wow, Grace! This is so gorgeous and so elegant!!! I love every single creation you make!! God Bless!!! Grace this is GORGEOUS, I love how you did those pines...!!!! Stunning creation and great colors! Wonderful Grace!!! Beautiful use of colour and that frame looks incredible!!! Sooo beautiful, Grace!! I just LOVE the punched border you created! Sooo perfect for this challenge!! just beautiful Grace! 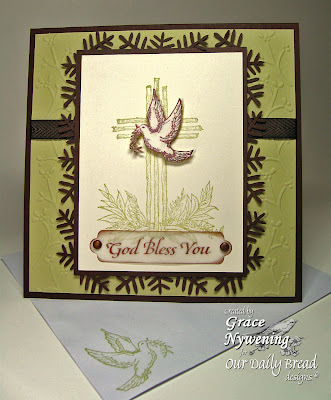 love the punched branches...and the dove on the envy is just the right touch! Beautiful designed card - Grace!!! How exciting that today is the first SCS Challenge day - wahooo!!! Grace this is so beautifully done. I love all the little details! This is so very beautiful Grace! So elegant! I love your color choices and beautiful layout! This is so beautiful! I just love it! The use of the twig punch and the dry embossing paired with your colors is soooo elegant! You sure rocked the challenge GF!! This is just beautiful, Grace! I love the peaceful colors. The embossing and punched frame are just wonderful. Really super! This is just beautiful. So soft and pretty! Ohhhh Grace,what a beautiful card,i love your image. This is gorgeous Grace! You're right we did have a lot of the same ideas...love the green and brown combo, and the vellum tag, and the branches behind really set it off so nicely. This is so beautiful, Grace! Fabulous image and creation! Wow this is really pretty and would be great for so many reasons. Yay for having ODBD at SCS and yay for the challenges and everything else. This is a lovely card Grace, I like the framing around the central image. Looking forward to finding a chance to play along. Love the colors you used on this one! Very earthy which coordinates with your punch perfectly!! Grace, you have once again created an amazing card. It seem like everything you touch is an amazing piece of work. Your use of the image on this card is wonderful. You managed to make the sketch look fantastic with all your layers and shape. Just a lovely my dear. Thank you for sharing your talent and humor with the DT this month. Love this beautiful card, Grace!! The punched border is so pretty!